Jennifer MackInday lives in Bloomington, Indiana, with her husband and son. She attended Indiana University and has spent much of her career in advertising and marketing. Jennifer is a freelance writer and the owner of several successful enterprises, the latest of which is Sandy Island Press, publishing company for Friends for Life. Jennifer believes her faith in God guides and comforts her through all things. She enjoys gardening, reading and cooking. Jennifer is a contributing writer for Demand Media Studios. Patti Donahue splits her time between Amado, Arizona, and Sandy Island in Ontario, Canada. She has been married for over 30 years and has three grown sons to whom she credits her inspiration along with her love of her Savior Jesus and the desire to share the free gift of Salvation. Early in her career, when asked to list her priorities, Patti quickly stated, "God, Family, Career." With that philosophy as her guiding principle, Patti has successfully balanced her family life and career as a corporate Director. Having worked more than 16 years in Mexico, she often describes herself as a true NAFTA woman. Friends for Life is her first published work. Does your group need an inspiring speaker for your next meeting? No matter the size of your group, our message will provide valuable information and understanding of our military families, PTSD, supporting American Heroes and more! 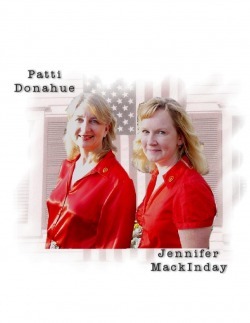 Authors Patti Donahue and Jennifer MackInday have years of experience speaking to groups and are passionate about supporting our service members and veterans.